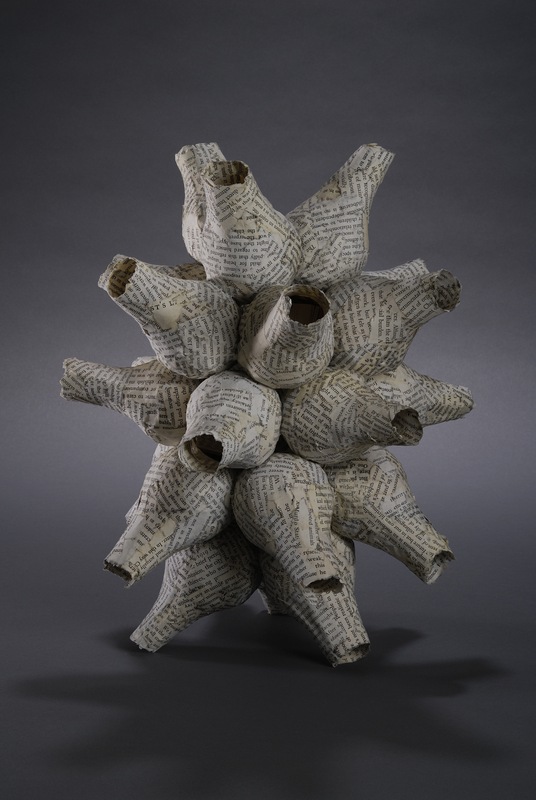 The story behind Holly Senn‘s book-based art (she creates sculpture using discarded library books as raw material) reads like the storyline from an HBO series – you know the ones – super smart, hip and even a bit unlikely. A tall redhead with cropped hair and architectural glasses, Senn works “as a virtual reference librarian at Pacific Lutheran University where, while surrounded by books, I interact with patrons who prefer digital resources.” Unperturbed by the irony of her life in academia, Senn has found a way to take the carapace of words – i.e., the book – and sculpt its pages into fantastic forms that are literally layered with meaning. “I create sculptures and installations in which I explore the life cycle of ideas – the organic, non-linear process in which thoughts have a genesis and then are disseminated, adopted or refuted, forgotten or referenced.” Ok, it’s too rarefied for primetime, but we’d rather check out a Holly Senn opening than catch the heir to The Wire, any time. For Spaceworks Tacoma, Senn is creating Re-Present, a site-specific installation of sculptures made with a modified version of traditional papier-mâche. “Environments are important to my process; I take inspiration from both my ongoing examination of botanical forms and the location surrounding exhibition spaces.” Re-present will open on Oct. 9 at 908 Broadway, a vintage address with resonance for Senn as it occupies the block which was once the site of Tacoma’s first library. It also faces the historic Pantages Theater. “I went back to the site several times,” she says, “carefully observing the surroundings in search of an inspiration. Finally, I went across the street and really looked closely at the Pantages and noticed the botanical architectural details. In addition, I realized that the color palate of the Pantages is similar to book pages….It seemed to fit with the themes and imagery I work with.” The large window of Senn’s exhibit space is highly reflective and, because it mirrors the Pantages, could create a lively dynamic between the art and its concrete inspiration. 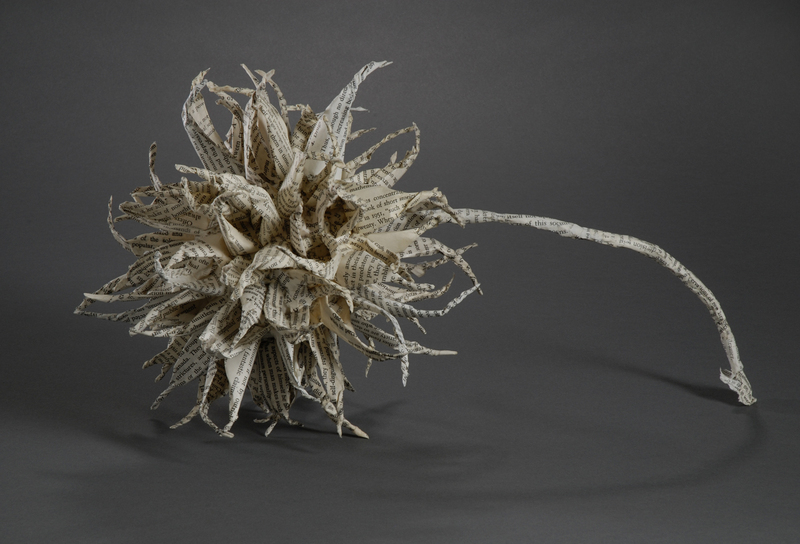 Discarded library books are the primary material for the majority of Senn’s works, which can take 40 to 80 hours for individual sculptures, and upwards of 300 hours for an installation. When one considers the time and intellectual labor that went into the writing of each now-dismantled book, the organic metaphor reaches even deeper: “As I cut, rip, realign and glue, I reflect on each new generation’s collective erasure of some element of its past and its casting of new ideas into the future.” Senn says that it was after she graduated from college that she began studying art: “In an effort to find harmony between my work as a librarian and an artist, I started working with paper about eight years ago.” Many of her sculptures take the form of huge buds, blossoms and pods resembling specimens from some primeval garden, with exquisite skins of words, ready to burst with ideas. We look forward to the next installment in this garden of delights.